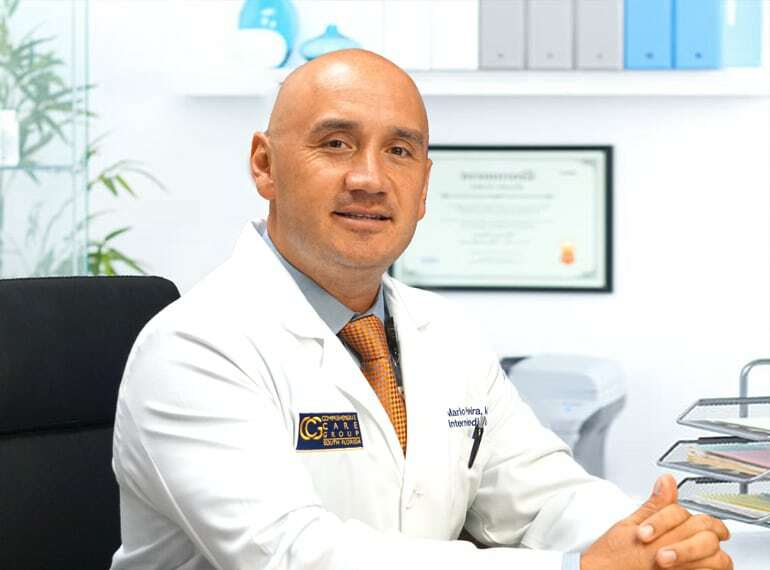 Dr. Pereira was born and raised Born and raised in San Salvador in 1975 and is fluent in both Spanish and English. 2009- After completing his residency in Internal Medicine and an additional year as Chief Resident at St. Peter’s University Hospital he moved to South Florida and began practicing as an Internal Medicine Hospitalist in Plantation, FL at Westside Regional Medical Center. As a Hospitalist, his responsibilities included the management of all admitted patients to the hospital including Medical/Surgical, Telemetry, Step-down and Intensive Care Units. This experience provided exposure into modern medicine and todays healthcare problematic. It became evident at this point that there was a large gap in healthcare being created by our fragmented healthcare system impacting those patients transitioning from the hospital to the outpatient setting. 2010 – After experiencing the “real world medicine” at first hand, it became necessary to take action towards the re-invention of traditional medicine and fill-in the gaps in our system that were creating a “Vacuum” – cracks in the system that lead to a dysfunctional and fragmented patient care. Healthcare is a complicated environment, difficult to navigate for most patients, with a serious lack in continuity of care. Everyday patients face different challenges unrelated to their medical illness that complicate their way to recovery. Hidden factors affecting outcomes: Insurance limitations, Hospital policies, lack of established protocols, medication coverage, legal pitfalls, financial restraints, socio-economic shortcomings, lack of resources and overstretched medical providers. As a founding partner, Dr. Pereira projected the vision that would address the “real world” healthcare problematic in a small scale with the ambition to one day benefit more patients and pave the way to better outcomes.ar disease. I want to make an appointment with this doctor.